Loadbalancer; Exposes the service externally using a cloud provider's load balancer. NodePort and ClusterIP services, to which the external load balancer will route, are automatically created. Ingress Resource : This operates on the at the application layer7, in TCP/IP stack, the HTTP level and offer more feature than layer4 service. Traefik is a modern HTTP reverse proxy and load balancer that makes deploying microservices easy. Traefik integrates with your existing infrastructure components and configures itself automatically and dynamically. Pointing Traefik at your orchestrator should be the only configuration step you need. Traefik Ingresses operate at the application layer of the network stack (HTTP) and can provide features such as cookie-based session affinity and the like, which services can't. We are going here to setup three sample nginx cheese web application, the docker images are located here . What is Name based routing ? 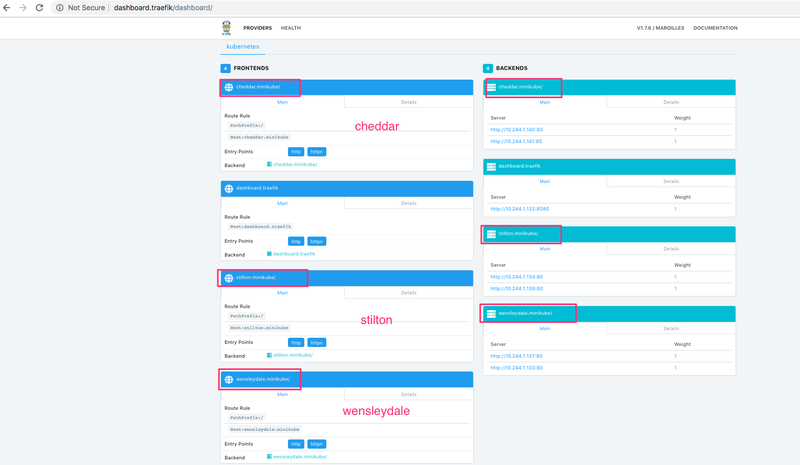 The Name-Based Routing performs routing by name and support routing HTTP traffic to multiple host names at the same IP address but different domain names , lets start by launching the pods for the cheese websites. Next we need to setup a Service for each of the cheese pods. At this point, we have deployment and Service ready in the K8 cluster, and we're about to define the ingress rules so that the world can eat the required service. For each service there is hostname defined for example the hostname stilton.minikube is mapped to stilton service. The rules are repeated for each service. Now visit the Traefik dashboard and you should see a frontend for each host. Along with a backend listing for each service with a server set up for each pod. Path based routing differ from Name based routing in a sense, we don't have multiple domains names, all the URI is distinguished and routed from the PATH prefix under a single domain, for example the above cheese application can be access through the single URI. You should now be able to visit the websites in your browser. Always measure your resource needs, and adjust requests and limits accordingly.